Amidst a continuous stream of headlines around digital trust and about major data breaches in enterprise and government agencies, the degree to which consumers have placed their trust in organisations to protect their personally identifiable information (PII) online has never been more relevant. In 2017 alone, the number of confirmed data breaches globally was staggering. Equifax, Reliance Jio, Netshoes, Deloitte, Uber, CEX, Jins, and Ticketmaster comprise just a sample of well-known brands that were involved in data breaches – reports the Frost & Sullivan Global State of Online Digital Trust. Meanwhile, in early 2018 it was revealed that Cambridge Analytica was not only exploiting Facebook user data to manipulate millions, it was openly boasting about interfering in multiple elections globally. Against this backdrop, it is crucial for business leaders to understand public sentiment concerning sharing their information online, as it has tangible consequences for their bottom line. With particular reference to payments and especially e-commerce, failure in the realm of data protection can be utterly fatal. And the consensus among consumers is clear: in a survey conducted by Frost & Sullivan, 78% of consumers responded that it is very important or crucial that their PII be protected online. Virtually no respondents indicate that protecting PII is not important. Furthermore, 86% indicate that a high level of data protection is a priority when choosing online services. Consumer trust in online services drives usage patterns: when a data breach is reported, 48% stop using that service. A well-known adage in the information security profession about data breaches is that for organizations it is not a question of if a breach will occur, but when. Half (48%) of organisations surveyed report having been involved in a publicly disclosed data breach, and nearly all found that the breach had a long-term negative impact to their revenues and to consumer trust. Half of those whose organisations that have been breached report a strong long-term negative impact not only on consumer trust (50%), but also on their business results (47%). In light of this, understanding what drives online digital trust is of paramount importance to business leaders. The survey conducted for this study examines this issue from the perspective of consumers, business executives, and information security professionals. The results reveal an extraordinary disconnect between the experiences of consumers and the perceptions of organisations who provide online services. The precarious nature of digital trust is illustrated by the decline of consumer trust in organisations over the past two years—only 38% indicate that their trust has increased, contrasted against the perceptions of business leaders, 84% of whom believe that consumers trust them more now than they did two years ago. It is apparent that organisations are dangerously out of touch with their customers. 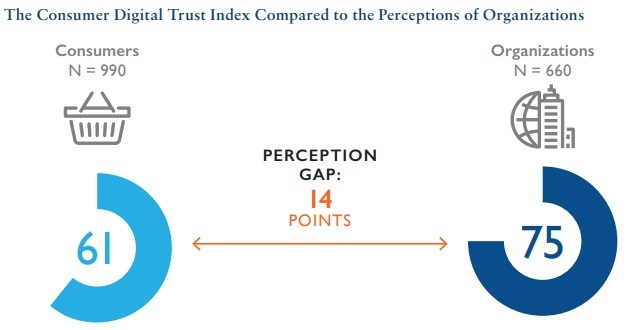 The digital trust perception gap, and other findings in this study, highlight the need for business leaders to understand how much consumers trust organisations, what drives digital trust, and the business impact of losing that trust.